Our organization is passionately engaged in offering an exclusive array of Modular Screen to the customers. These products are made from high quality components. With our in-depth knowledge of this domain, we are actively engaged in manufacturing and supplying an excellent quality range of GRC Screens. Phifer Bronze Screen is a metal screen made of 90 percent copper and 10 percent zinc to provide strength and durability. It begins as a shiny copper color and weathers to a beautiful dark bronze finish. Bronze Screen is ideal for unique architectural copper accents for homes and is a popular product for historical dwellings. Bronze Screen is an excellent choice for inland and coastal regions. 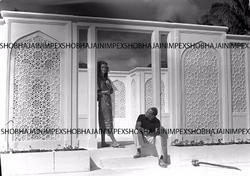 We are teh renowned manufactureres of Jaipur area who are making avaiable "Architectural Screens" to our buyers at good competative prices. This jali work will make every onlooker go back into the days of yore when every palatial house used to be decorated with this. This work truly deserves praise! Having a positive quality management system, we are involved in presenting a comprehensive compilation of Designer Architectural Screen. The fixed fin support structure has been designed to accommodate any angle between 0° and 180° with increments of 5 degrees. The fin angle can be set during installation. For the fixed fin system each fin is ‘snapped’ into position by sliding the U-profile section over the fin suspension. The fast and easy installation, requires a minimum of tools. Grand GRC Prefab Pvt. Ltd. is specialist in all varieties of industrial, commercial and residential interior / exterior decoration of buildings. The company is dynamic in designs of GRC screens, fascia, cladding panels, fabrication of GRC, GRG, GRP elements etc. 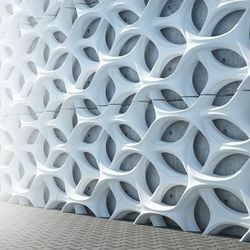 At Architectural Groomers you will have all kinds of GRC Screen (Jaali) for your building, home , restaurants, corporate offices exteriors. We have all latest designs to suits your lifestyle. - As an architectural practice, we play a crucial role in the sustainability of our environment we build in and the people we are building for.